Adapting Shakespeare to the screen can be a tricky thing. One can go one of two ways: keep Shakespeare within the time frame of the original story (the Elizabethan/Jacobean era) or setting the play at another time. When one sets a Shakespearean work at any other time period, we run into another problem: keep the language or update it to something more current. Sometimes keeping the language can work (Kenneth Branagh's version of Much Ado About Nothing) or it can be ridiculous (Baz Luhrmann's version of Romeo & Juliet). If one decides to update the story, you can have both good films (10 Things I Hate About You as the teenage Taming of the Shrew) or not-so-good films (She's The Man as the teenage Twelfth Night). As a passionate lover of Shakespeare, I tend to worry when a film decides to keep the language and change the setting. However, even I, a man who considers the plot of Anonymous to be blasphemy, had yet to encounter Coriolanus, which is perhaps considered a 'minor' Shakespearean drama. Certainly this tale of blood and gore doesn't have the pull of something as deep as Hamlet or as light as A Midsummer Night's Dream. 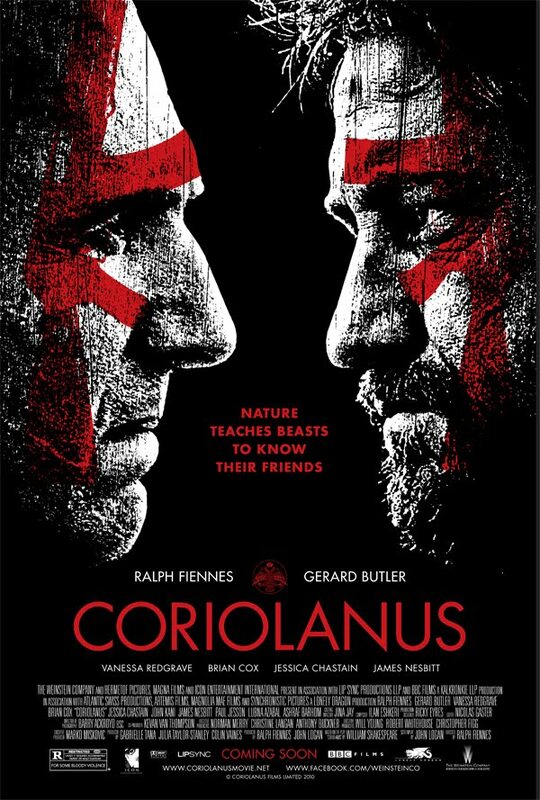 Therefore, it's a fair guess that few people are well-versed in Coriolanus, thus allowing Ralph Fiennes' film version of the play to be both true to the language and remarkably relevant to today. Rome is at war, with a weak economy and riots in the streets. The leaders in the Senate, led by Menenius (Brian Cox) work to appease the common Roman people. Opposite that is General Cauis Martius (Fiennes) has nothing but contempt for the common people or plebeians, daring to question the aristocratic patricians. Martius knows nothing but war and Rome is fighting the Volscians, led by his bitter rival Tullus Aufidius (Gerard Butler). Martius is triumphant in war, and returns a hero, with the Senate giving him a new name: Coriolanus, in honor of his victory at Corioles. His mother Volumnia (Vanessa Redgrave) pushes her son to agree to be elected consul, but the two tribunes Sicinius (James Nesbitt) and Brutus (Paul Jesson) have not forgotten Coriolanus' arrogance and contempt for the plebeians. They do not want him, but at first Coriolanus manages to win the public over. Eventually, the pushing of the tribunes unleashes Coriolanus' true contempt for the common man: he always found the idea of complimenting the public or going to them for their approval against his nature and let's them know. The tribunes banish Coriolanus, and in his hatred Coriolanus plans vengeance. He wanders the countryside, until coming to Antium and Aufidius. In an 'the enemy of my enemy is my friend' mindset, Coriolanus joins Aufidius to march on Rome itself. The population is in a panic, and it sends Menenius to plead he turn his wrath. Coriolanus will not be moved, but then they send Volumnia, Coriolanus' wife Virgilia (Jessica Chastain), and his child to plead their case. Again, he will not be moved. Volumnia condemns her son for his treachery, and finally he is moved. He makes peace with Rome, but in doing so betrays his frenemy Aufidius. With this, Aufidius enacts his own revenge: a bloody one. Again, adapting Shakespeare where one keeps the language and changes the setting can work or not work. It depends entirely on how the transition is made; if they emphasize the language too much or make it sound grand, or forced, or unnatural, or out-of-place to the speaker and listener it will only draw attention to the discrepancy (Luhrmann's Romeo & Juliet) . If it sounds natural and flows as though this is the way people actually speak (Much Ado About Nothing) then it adds to the pleasure of the viewing. 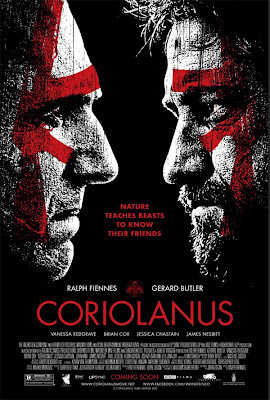 Coriolanus, under Fiennes' debut as director, is the latter. He does this by forgoing the temptation to exaggerate the language but instead focusing on how people speak. The flow of the language is natural, with all the actors speaking their lines in a normal conversational tone. Even when the language and scene call for rage, as when Volumnia rails against her son, there never is a moment when any of the actors go over the top. In fact, everyone in the cast is in perfect control of their performances, not just speaking in natural tones (calm when the scene asks for it, anger but never out-of-control when a character is riled up) but also in how they behave. Take when Meninius returns defeated from his plea to his old student and friend. He tells General Cominius (John Kani) that there is no mercy within Coriolanus. Rather than deliver his lines in a grand way, Cox speaks them in almost a whisper, a resignation that there is no hope for reconciliation between Coriolanus and the city he once fought for. Fiennes' directing of the acting was excellent, especially for his debut as a director; he was aided by having a galaxy of brilliant actors to work with (and Gerard Butler too). Perhaps I'm being a bit facetious in mocking Butler, who frankly has been in his share of clunkers (Law Abiding Citizen, P.S. I Love You, and 300, where it was his brawn more than his acting that was the draw). However, he too was remarkably calm as Aufidius, especially given how easily being a warrior could have made being over-the-top. Cox I find is an actor who is only as good as his material: when he is in good films (The Bourne Supremacy) he is good, but when he's in a bad film (Troy) he is just awful. Here, he not only is good, but he gives one of his best performances as the compromising but ultimately crushed Meninius. I can't leave out the ladies. Chastain, who seems to be in everything this year has a small role as Virgilia, but her gentle Roman wife was a brilliant counterpoint to all the blood and thunder going on around her. That blood and thunder belongs to Redgrave as the pushy Volumnia, seeking power for her son but not interested in how he felt about bowing to the common people. She manages to intimidate and frighten everyone who goes against her to harm her son, and how she tells Virgilia that she would rather have a dead son filled with honor than a living one who did not fight is spoken as in conversation but is still chilling. 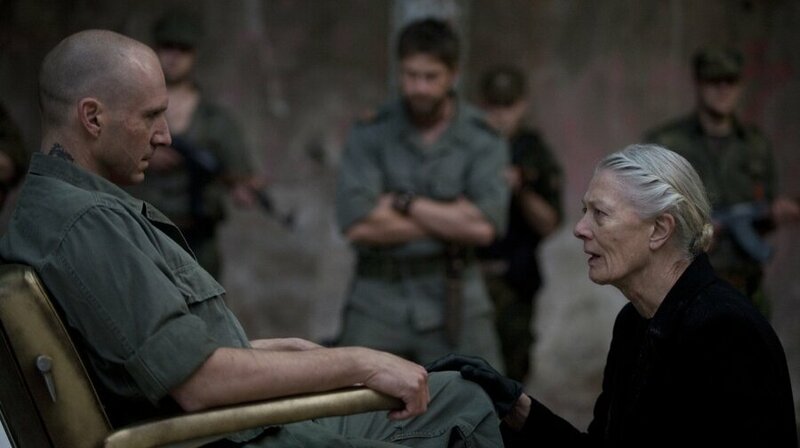 One of the benefits of filming Coriolanus is that it is not a well-known play. Therefore, having a modern-day setting makes the play more relatable and contemporary, as if minus the language it could actually be happening today. The setting may be Rome but the overall look is vaguely Yugoslavian (or the remnants of the former Yugoslavia), an Eastern European-style setting either suffering war or barely coming out of it. Having the Volscians referred to as "Volsce" (pronounced Volski) makes it sound even more Eastern European, thus lending it more of an air of reality. If there is something to dislike about Coriolanus is the endless shaky hand-held camera method of filmmaking. I suppose this was done to make it more 'you are there', but at times it can be a bit too much. A scene where we are with the Volscian army complete with a rock-like music veers into a bit of music-video style of movie which it doesn't need. On the whole, these aren't enough to bring down Coriolanus, though I imagine the language may not be to everyone's taste. Ralph Fiennes has already proven himself to be a fine actor, and now he's shown he is capable of making a strong film from a relatively-little known Shakespeare play. Coriolanus is a film that both patrician and plebeians would approve of.